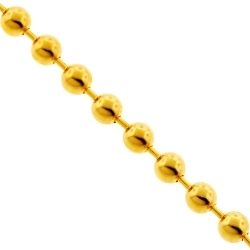 Army bead chains got their name from the style of necklace that holds an enlisted man's dog tag pendant. Although these bead necklaces are extremely popular in the military, a lot of celebrities started wearing gold ball chains in music videos and daily life. As the result, army bead chains are getting more and more popular among all jewelry enthusiasts. 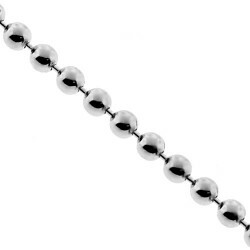 This moon cut necklaces features round or oval beads fixed along a chain, or easily sliding along it. 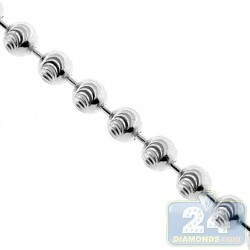 There can be some distance, or absolutely no space, between balls. 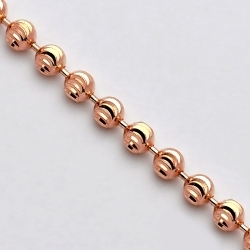 At 24diamonds.com we offer the largest collection of handsome gold ball necklaces, including fancy beads with moon-cut and diamond-cut patterns, or just highly polished smooth ones. 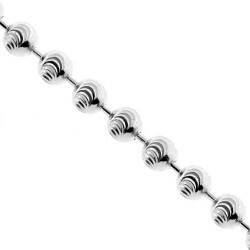 Here you will find men's and women's bead chains of the highest quality, made of Italian 925 sterling silver or gold of 10k, 14, and 18k purity. 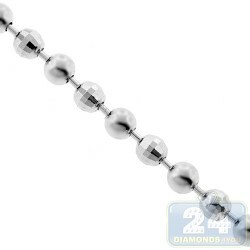 You can select from lots of sizes, from 1 mm to 5 mm in thickness and from 16 to 40 inches in length. This type of necklaces is an ideal piece to pair with favorite pendants. It could be worn individually as well, depending on your style, taste and mood!